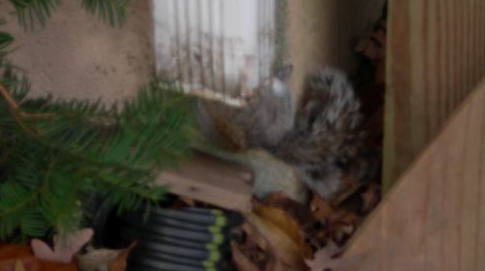 This morning’s adventure – a squirrel entered our downspout from up on the roof. I could hear him scrabbling around up there where the spout bends toward the side of the house just under the eave. Standing on the seating of the deck, I tried to disconnect that portion of the downspout (our gutter guys did this once before when a critter got in, so I know it can be done without damaging anything). Unfortunately due to lack of brute force and/or manual dexterity on my part, I could not get the pieces separated. I thought, why don’t I try to run a rope down the downspout from the top and maybe that would give the squirrel something to hold onto to climb out. (And maybe then the squirrel could hold the rope in its teeth and rapel down the side of the house to safety on the ground!). So I got a rope and the ladder, got up onto the roof and tried to run a rope down into the downspout from above. Well, it didn’t seem to be feeding into the bend too well. And maybe the squirrel would not be on the same wavelength with me regarding climbing techniques. So while up on the roof I noticed that the gutters were clogged with leaves and such and took time out from squirrel rescuing to clean the gutters on both the house and carport. So the squirrel was still trapped. Well my next move matched squirrel-think exactly. If we can’t get out from the top, then we’ll have to get out from the bottom! I tried to dislodge the plastic sleeve and tubing we used to continue the downspout underground. Alas, no could do. I had to get out a knife and cut the tubing to pry off the sleeve and open the bottom of the downspout. 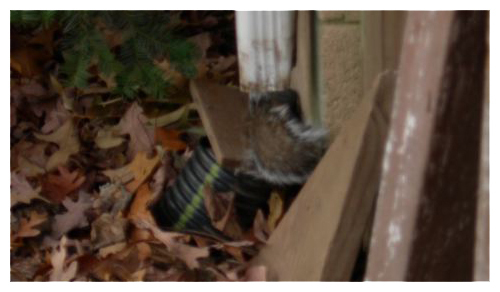 I covered our tubing that runs into the ground with a small piece of wood to make sure the squirrel would not fall from one downspout into another. Here, the squirrel and I had a disconnect. 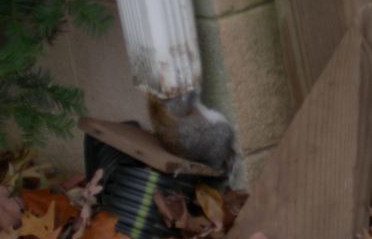 I could not tell if the squirrel was being extra cautious about coming out of the downspout or if it was just plain stuck. Well this had gone on long enough. By 12:24 pm, below, the squirrel had still not got out and I felt that after an hour of trying, he deserved a break. So at that point, I got out the tinsnips, approached the downspout with the squirrel scampering madly back inside again – and cut the bottom of the downspout up about 3 inches. I wish I had a picture of that squirrel flying out of that downspout so fast that I knew I’d done the right thing (especially since we don’t need a furry plug at the end of our downspout). I was a little miffed that the squirrel didn’t stop to say thank you as he flew off the edge of the retaining wall, bounced off the nearest tree and disappeared into the woods. He’ll be back for supper later, I bet.